Cream units ooze style. It’s a timeless and very classic way to update a kitchen. Lighter colours give the illusion of more space too – it brightens the area and allows any natural light to reflect off them. 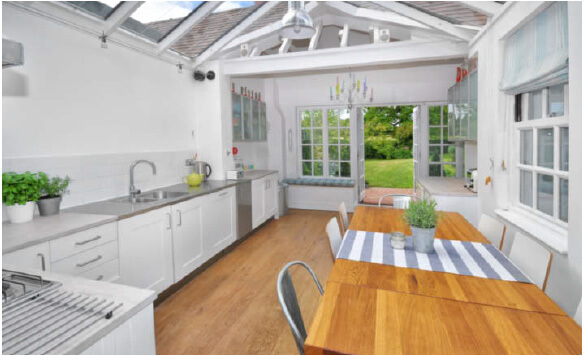 A cream kitchen is always a good selling point too – there’s nothing to offend a potential buyer in the future! And for the walls: If you choose cream units, good colours to complement these for the walls would be something like dove grey. Another neutral, but this would add depth to support the units. And depending upon your choice of grey, it may also incorporate blue tones to the walls too. A fantastic colour to hide the dirt! Offset the dark grey (look for names like gunmetal grey), with some stylish metal handles and your kitchen could look way more expensive that it really was. And for the walls: If you feel adventurous – a fantastic deep mustard would be a really stylish look. If you’re not so adventurous, then anything neutral from cream or magnolia through to a lighter grey would be a good choice. The word green encapsulates so many different hues. From spring green through to electric green via moss green and everything inbetween. For a classic kitchen, something like a sage green is a safe bet. Farrow & Ball do a fantastic range of classic colours with names like Card Room Green and Cooking Apple Green which are found in many of the country’s grandest homes. And for the walls: Safe choices to complement your greens would be cream, light grey or other shades of green. Off-piste choices that could really work if you get the right shade, are violet-infused hues! One tip – when trying unusual colour combinations, patch test the two side by side on all the walls of your kitchen. It will look different in every light, so be sure you like it from every angle before taking such a bold move. Dark blue will act like grey – it will hide dirt and add depth but will only look good in larger kitchens that have the space to carry it off. Light blues always look fresh and will add a ‘New England’ style feel to the kitchen. If you like simpler styles like Shaker replacement doors, then this would be a good teaming. And for the walls: Other shades of blue, cream or light grey would look best. Of course, you’re not limited to the choices above, but we just tried to cover some of the more classic combinations and choices to give you a head start. Good luck with your kitchen makeover!